Nerves are extremely vulnerable when subjected to external forces. There are certain critical areas where they are at risk in this way. The nerves to the upper limb arise in the neck, and the nerve roots leaving the spine pass through small bony openings in which they can be pinched by arthritic bone or degenerative intervertebral discs, causing pain in the area to which the nerve goes, in the arm or hand. This pain may seem to arise in the area supplied, making diagnosis difficult, but clinical tests and investigations are helpful in confirming suspicion of this cause of pain, and physiotherapy to the neck can be very helpful. More significant disease in the neck may require referral to a spinal surgeon (orthopaedic or neurosurgeon). Less commonly the area between the neck and shoulder is the site of compression, known as the thoracic outlet. Diagnosis and treatment can be more difficult and may again need specialist referral. There are places in the arm where nerves are vulnerable. The commonest is the carpal tunnel, dealt with under a separate heading. The next most common is the ulnar nerve at the elbow. Here the nerve passes behind the sharp medial epicondyle (funny bone) and is at risk for three reasons; the nerve is placed under tension when the elbow is flexed; the nerve is resting on a hard bone surface against which it can be pressed or knocked; and there is a fibrous roof overlying it, forming a tunnel which can constrict the nerve. A previous fracture in the elbow region accentuates these problems. Compression of the nerve in this area (often referred to ulnar neuritis or neuropathy) causes tingling in the little and ring fingers, numbness there, pain, and weakness in small muscles of the hand. The effect of this weakness is noticeable as difficulty in pinching tightly between thumb and fingers, and inability to straighten the fingers completely, or claw deformity, especially in the ring and little fingers. Diagnosis is confirmed by an electrical test called a nerve conduction study (EMG), which measures the speed of impulse conduction in the nerve at the affected area, providing information also about the severity of compression. Mild symptoms without much conduction delay can be treated by avoiding elbow flexion during sleep by the use of a splint, but if there is any significant sustained interference with nerve conduction, surgical treatment is indicated. In most cases simple decompression of the nerve is effective, often combined with flattening of the bone prominence under the nerve (epicondylectomy). Sometimes the nerve has a tendency to flick in and out of the groove behind the epicondyle, in which case the whole nerve can be moved in front so that it takes a short cut from arm to forearm. This operation of nerve transposition used to be widely practiced, but is less often done now because it is usually not necessary, and the amount of mobilization of the nerve required may in itself be potentially harmful to the nerve. Other nerves are much less commonly compressed. On the back (extensor side) of the forearm the posterior interosseous nerve can be compressed, producing an aching pain very similar to tennis elbow. Rarely compression causes weakness of muscles straightening the fingers. Decompression is effective in either case. 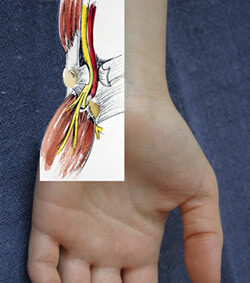 The anterior interosseous nerve can be compressed in the forearm, causing loss of bending of the thumb and index finger. Decompression may be indicated. The results of releasing nerve decompression are usually good. Severe nerve compression and advanced age are possible reasons for disappointing recovery. There is a genetically inherited syndrome in which there is a tendency to multiple nerve compressions, and in these patients recovery may not be as good as expected.